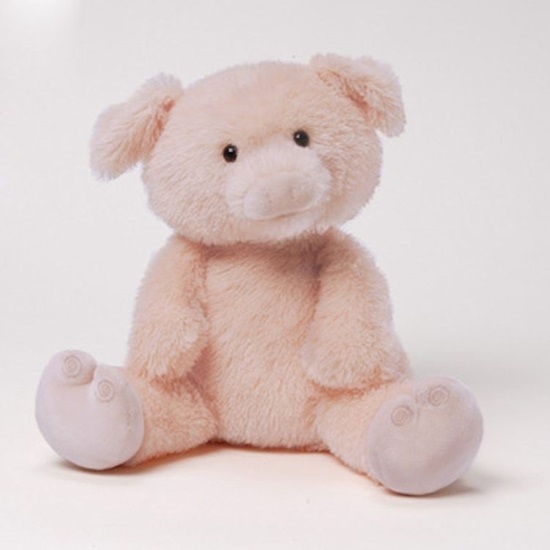 This is a 10-inch (seated) soft plush animated toy that recites the nursery rhyme "This Little Piggy"
Introducing "This Little Piggy" from the Gund Baby line by GUND. This is a 10-inch (seated) soft shaggy plush pig that recites the nursery rhyme "This Little Piggy" when it's toes are squeezed. At the end of the rhyme, it giggles and snorts and is sure to make your little ones giggle right along with it! "This Little Piggy" is made up soft shaggy pink fur with pink plush paws and a soft pink plush snout. It is animated and moves while reciting the nursery rhyme. Your children will love this interactive Little Piggy toy. "This Little Piggy" is good for ages 10 months and up, is surface washable, and comes with 3 AA replaceable batteries.